Hitler is Dead, Il Duce is a bad memory, and the Emperor is no longer a God--Time to live in peace, right? WRONG! Stalin is stirring up the Russians, Mao is making the Chinese crazy, and worldwide everyone is either becoming a Communist or is having fits trying to fight them with all their might. Welcome to the minor (and not so minor) wars, uprisings, convulsions, emergencies, and, of course, police actions of the post war period. On the following pages, we hope to bring you pictures, portrayals and information about the men and women who fought, their kit, weapons and, since this is a certified Knacker site, their RATIONS! Remember: War is Hell-Police Action is Heck! 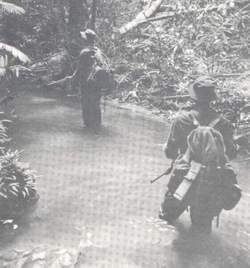 On the following pages we wish to bring you a short history of the conflicts of the post-WW2 era, beginning with two defining events in the immediate post-war period, namely the successful British action against communist insurgency in Malaya and the not so successful French attempt to achieve the same in Indochina. Please see the "Troublespots in the making" link on our menu bar for a preview of upcoming articles. Please make sure to put "Post WW2" in the subject line.